Richard L. Abel. Lawyers on trial : understanding ethical misconduct. Oxford University Press, c2011. The records of disciplinary proceedings offer a penetrating, and largely ignored, perspective on how lawyers misbehave. Because the lawyers' professional lives are at stake, the factual records are extraordinarily detailed and the lawyers surprisingly open about their motivations and justifications. This book presents the stories of ten California lawyers who broke the rules. It begins by showing how nearly a century of political struggle over self-regulation shapes the way the disciplinary system selects and processes cases and concludes by canvassing reforms that could improve the performance of the legal profession. Ralph A. Rossum. The Supreme Court and tribal gaming : California v. Cabazon Band of Mission Indians. University Press of Kansas, c2011. 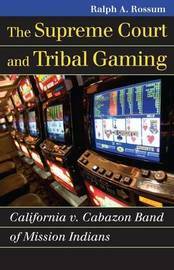 This book explores the origins, arguments, and impact of California v. Cabazon Band of Mission Indians, the 1987 Supreme Court decision that reasserted the unique federally supported sovereignty of Indian nations, effectively barring individual states from interfering with that sovereignty and opening the door for the explosive growth of Indian casinos over the next two decades. The author provides historical grounding for the case through a cogent analysis of previous decisions and legislative efforts from the late colonial period to the present, tracking the troubled course of Indian law through a terrain of abrogated treaties, unenforced court decisions, confused statutes, and harsh administrative rulings. Corporate Laws Committee. Model business corporation act : official text with official comments and statutory cross-references, revised through December 2010. American Bar Association, Section of Business Law, c2011. Edward Brodsky, M. Patricia Adamski. Law of corporate officers and directors : rights, duties, and liabilities. West, 2011. Michael L. Moffitt, Andrea Kupfer Schneider. Dispute resolution : examples & explanations. 2nd ed. Wolters Kluwer Law & Business, c2011. Charles R. McElwee. Environmental law in China : managing risk and ensuring compliance. Oxford University Press, c2011. Göran Lind. Common law marriage : a legal institution for cohabitation. Oxford University Press, 2008. Guide to EU pharmaceutical regulatory law / edited by Sally Shorthose. Aspen Publishers, c2010. New Day Films, Peter Cohn. Golden venture [videorecording]. Hillcrest Films, c2006. M. Parish. Mirages of international justice : the elusive pursuit of a transnational legal order. Edward Elgar, 2011. Hong Xue. Cyber law in China. Aspen Publishers, c2010. The politics of international economic law / edited by Tomer Broude, Marc L. Busch, Amelia Porges. Cambridge University Press, 2011. Georgios N. Yannopoulos. Modelling the legal decision process for information technology applications in law. Kluwer Law International, c1998. Mary Miles Prince. Prince's dictionary of legal citations : a reference guide for attorneys, legal secretaries, paralegals, and law students. 8th ed. W.S. Hein, 2011. Margaret Krause, Sara Sampson. State documents bibliography : Virginia. 2nd, rev. ed. American Association of Law Libraries, Government Documents Special Interest Section, c2010. Ryan Valentin, Michelle Cosby. Kentucky state documents : a bibliography of legal and law-related material. AALL/GDSIS, c2008. Mari Cheney. Utah legal resources bibliography. Government Documents Special Interest Section, AALL, c2009. Terrye Conroy, Stacy Etheredge, David Lehmann. State documents bibliography : South Carolina. GD-SIS, c2009. Leina'ala R. Seeger. Hawaii state documents : a selective bibliography of legal publications and related materials. Government Documents Special Interest Section, AALL, c2010. Deborah K. Hackerson. A bibliography of Minnesota legal documents. 2nd ed. American Association of Law Libraries, Government Documents Special Interest Section, c2010. Joel Fishman. Pennsylvania state documents : a bibliography of legal and law-related material. 3rd ed. American Association of Law Libraries, Government Documents Special Interest Section, 2007. Stephanie Midkiff, Wendy Schroeder Hitchcock. State documents bibliography, Oregon : a survey of Oregon state legal and law-related documents. American Association of Law Libraries, c2009. Rhonda R. Schwartz. North Dakota state documents : a selective bibliography of legal and law-related material. AALL/GDSIS, c2009. Gail F. Whittemore. New York legal documents 2007 : a selective annotated bibliography. American Association of Law Libraries, 2007. Theresa Strike. Guide to New Mexico state publications. 3rd ed. AALL, c2009. Karin Johnsrud, Sarah Jaramillo. New Jersey state documents : a bibliography of legal resources. Government Documents Special Interest Section, American Association of Law Libraries, c2011. Darin K. Fox. State documents bibliography, Oklahoma : a guide to legal research in Oklahoma. American Association of Law Libraries, 2009. Judy A. Stark. State documents bibliography : Missouri. AALL/GDSIS, c2010. Barbara Fritschel. State documents bibliography : Wisconsin. American Association of Law Libraries, Government Documents SIS, 2009. Jennifer Davitt. State documents bibliography Washington, D.C. American Association of Law Libraries, 2008. Peter J. Egler. Selective annotated bibliography of Delaware state documents and other resources used in Delaware legal research. American Association of Law Libraries, Government Documents SIS, 2008. John Rao, et al. Foreclosures : defenses, workouts, and mortgage servicing. 3rd ed. National Consumer Law Center, c2010. Anthony Mancuso. How to form a nonprofit corporation. 10th ed. Nolo, 2011. Leslie W. Abramson. Acing professional responsibility : a checklist approach to professional responsibility problems. Thomson Reuters/West, c2009. Encyclopedia of the Supreme Court of the United States / edited by David S. Tanenhaus. Macmillan Reference USA, c2008. The future of housing finance : a progress update on the GSEs : hearing before the Subcommittee on Capital Markets, Insurance, and Government Sponsored Enterprises of the Committee on Financial Services, U.S. House of Representatives, One Hundred Eleventh Congress, second session, September 15, 2010. Legislative hearing on H.R. 3149, the Equal Employment for All Act : hearing before the Subcommittee on Financial Institutions and Consumer Credit of the Committee on Financial Services, U.S. House of Representatives, One Hundred Eleventh Congress, second session, September 23, 2010. Protecting America's harvest : hearing before the Subcommittee on Immigration, Citizenship, Refugees, Border Security, and International Law of the Committee on the Judiciary, House of Representatives, One Hundred Eleventh Congress, second session, Friday, September 24, 2010. Prohibiting certain high-risk investment activities by banks and bank holding companies : hearing before the Committee on Banking, Housing, and Urban Affairs, United States Senate, One Hundred Eleventh Congress, second session, on examining recent restrictions placed on commercial banks and bank holding companies' high-risk investment activities, February 2, 2010. Nomination of Robert M. Groves : hearing before the Committee on Homeland Security and Governmental Affairs, United States Senate, of the One Hundred Eleventh Congress, first session : nomination of Robert M. Groves to be Director of the Census, U.S. Department of Commerce, May 15, 2009. NASA : issues and challenges : hearing before the Subcommittee on Science and Space of the Committee on Commerce, Science, and Transportation, United States Senate, One Hundred Ninth Congress, second session, April 25, 2006. Legislative proposals in the Department of Housing and Urban Development's fiscal year 2011 budget request : hearing before the Committee on Banking, Housing, and Urban Affairs, United States Senate, One Hundred Eleventh Congress, second session, on discussing legislative proposals in the Department of Housing and Urban Development's FY 2011 budget, April 15, 2010. Continuing oversight on international cooperation to modernize financial regulation : hearing before the Subcommittee on Security and International Trade and Finance of the Committee on Banking, Housing, and Urban Affairs, United States Senate, One Hundred Eleventh Congress, second session, on collaborative international efforts to promote financial regulatory reform, July 20, 2010. China's exchange rate policy and trade imbalances : hearing before the Subcommittee on Economic Policy of the Committee on Banking, Housing, and Urban Affairs, United States Senate, One Hundred Eleventh Congress, second session, on examining the effect that China's exchange rate policy has on trade flow, U.S. manufacturers, and workers, April 22, 2010. Restoring credit to Main Street : proposals to fix small business borrowing and lending problems : hearing before the Subcommittee on Economic Policy of the Committee on Banking, Housing, and Urban Affairs, United States Senate, One Hundred Eleventh Congress, second session, on examining restoring credit to Main Street, proposals to fix small business borrowing and lending problems, March 2, 2010. Local perspectives on the Livable Communities Act : hearing before the Committee on Banking, Housing, and Urban Affairs, United States Senate, One Hundred Eleventh Congress, second session, on examining the Livable Communities Act, June 9, 2010. Decisions on the future direction and funding for NASA : what will they mean for the U.S. aerospace workforce and industrial base? : hearing before the Committee on Science and Technology, House of Representatives, One Hundred Eleventh Congress, first session, December 10, 2009. Fiscal year 2011 research and development budget proposals at the Environmental Protection Agency (EPA) and the National Oceanic and Atmospheric Administration (NOAA) : hearing before the Committee on Science and Technology, House of Representatives, One Hundred Eleventh Congress, second session, March 10, 2010.